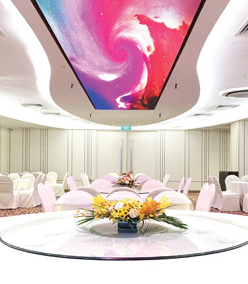 Pavilion Singapore is an elegant and modern venue with state of the art technology, best suitable for banquets, weddings, corporate events and celebrations. Boasting a 10 meter long LED ceiling above the red carpet, and complete with a 3.5 meter LED screen for your stage backdrop, be prepared to take your event live with beautifully executed themes. Pavilion Singapore hosts up to 30 banquet tables, and 700 to 1000 pax cocktails and buffets. With banquet dinners starting at only $788 per table, Pavilion Singapore offers an affordable alternative to hotel reservations without compromising on venue aesthetics, food quality, packaged decorations and high-technology facilities. We take your fun seriously. We build your dream around you. Host your next event at Pavilion Singapore and promise your guests an exceptional experience every time.